Materials: Adriafil EraOra (83) 6- 6- 7- 7 balls, size 4 mm (6US-8UK) straight and size 4 mm (6US-8UK) double-pointed knitting needles. 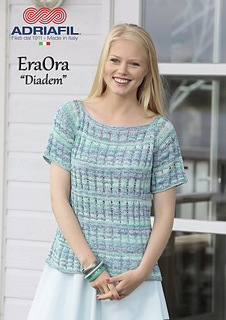 The garment can also be made using the following Adriafil yarns: Cheope, Kimera or Snappy Ball. Tension: Using 4 mm needles, 22 sts and 31 rows in Stocking st = 10x10 cm (4x4”). Take time to check tension and switch needles if necessary.